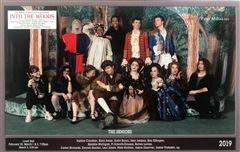 From February 28 to March 3, the Hopkins Drama Association (HDA) performed the winter musical Into the Woods, directed and produced by Michael Calderone and Erika Schroth. On January 11 and 12, 21 Hopkins musicians traveled to Platt High School in Meriden for the Connecticut Music Educators Association (CMEA) Southern Regional Festival. On Saturday, January 26, the Hopkins Jazz/Rock Ensemble traveled to Boston, Massachusetts for the annual Berklee College of Music High School Jazz Festival. On February 7 and 8, Hopkins Drama Association (HDA) began The Sixth Show: An Evening of Comedy One Acts, directed by Hope Hartup.